Salty, sweet, and so easy! 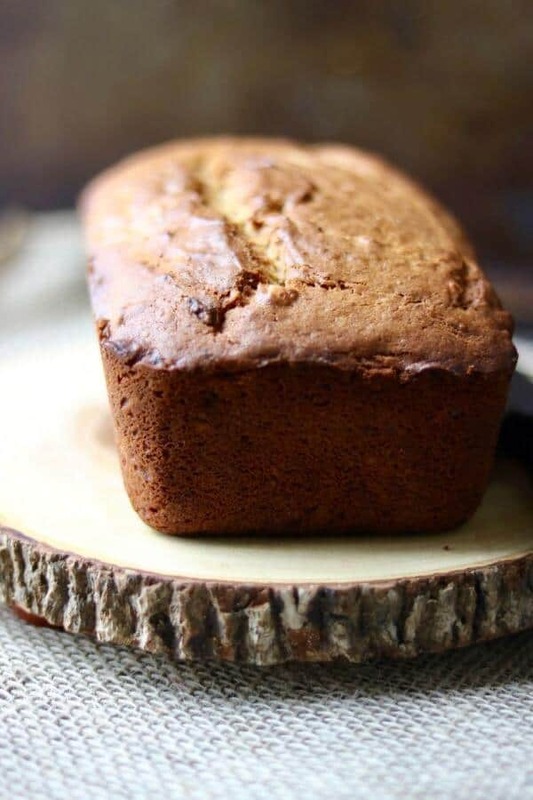 Peanut butter banana bread recipe is an old family favorite — one that I grew up with. 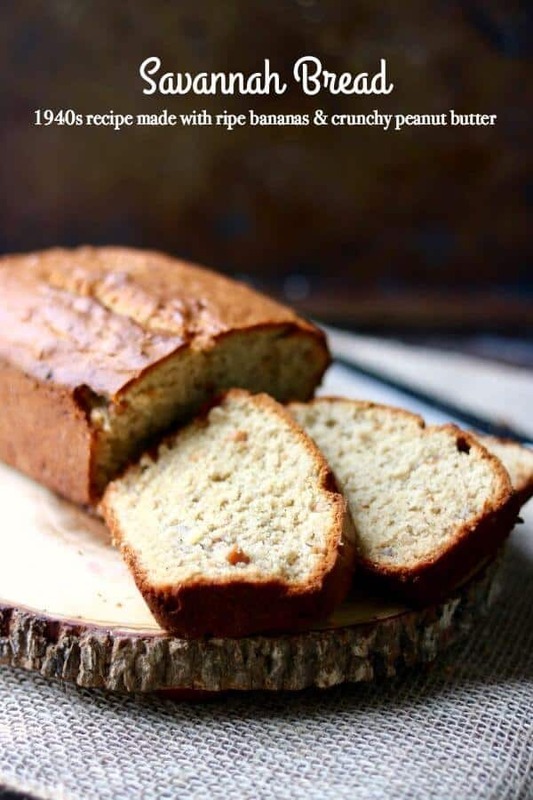 We called it Savannah bread and I don’t know where my mom found the recipe. I’ve never seen, nor tasted, anything quite like it. It’s just right for breakfast or brunch – out of this world with a layer of Nutella swirled across a slice. Those of you who have lost parents will understand when I say that sometimes I start dialing the phone even though It’s been 15 years and more since my parents died. My dad passed away in 2001 and my mom in 2002. It happened last week actually. My son who is in his senior year in high school had his animation film go to the state finals. My husband and I drove down to Austin to watch three hours of films created by Texas high schoolers. It was incredible. Anyway I walked into the hotel room afterward, grabbed my cell phone, and began to dial their number. The number I grew up with, the number I haven’t heard my mother answer in all those years. I have NO idea what caused that automatic reaction other than I just wanted to share my pride in my son. It always takes me by surprise when something like that happens. The other day I was paging through a cookbook and an index card fell out. Savannah Bread. Wow, did that make me stop in my tracks! I’ve never seen another recipe for Savannah Bread and even a Google search didn’t bring anything up. I have no idea why it’s called that except that Dad was stationed at Ft. Benning, Georgia when he was a training officer in the early 1950s. I wondered if it had to do with Georgia peanuts and the city of Savannah? 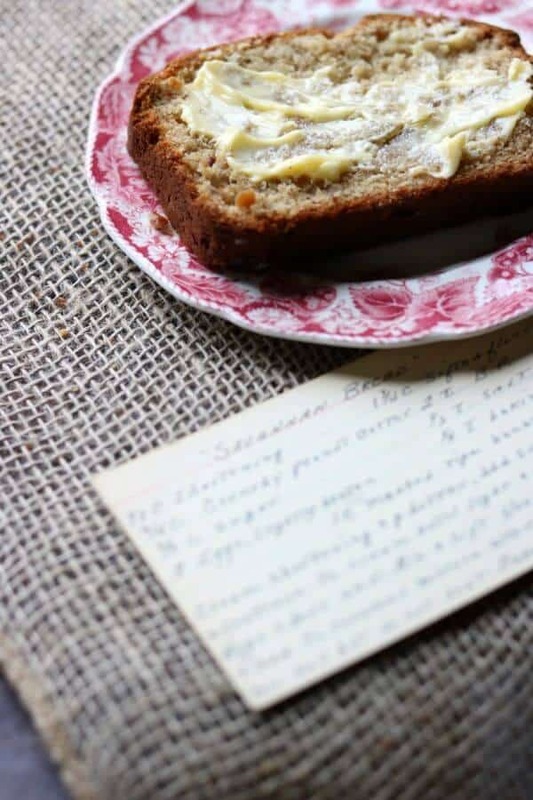 The peanut butter banana bread recipe was written in fading blue ink and it brought back so many memories that I had to make it. I wanted to taste it again to see if it was as I remembered it. Of course it wasn’t because no one makes food taste like Mom’s, right? Anyway, making this peanut butter banana bread recipe was like spending an afternoon with my mom. Despite my low carb diet (my doctor prefers me to be on it because I had my thyroid removed in 2009) I gave myself permission to like the rubber spatula and to enjoy a piece while it was still warm from the oven. The smell that wafted though the house was pure 1967 home to me. I’m inviting you into my childhood with this recipe. It’s simple, not too sweet, and every bite is a taste of my past. Enjoy! As most of y’all know I prefer glass pans. This one has its own cover to keep your bread fresh right in the pan. 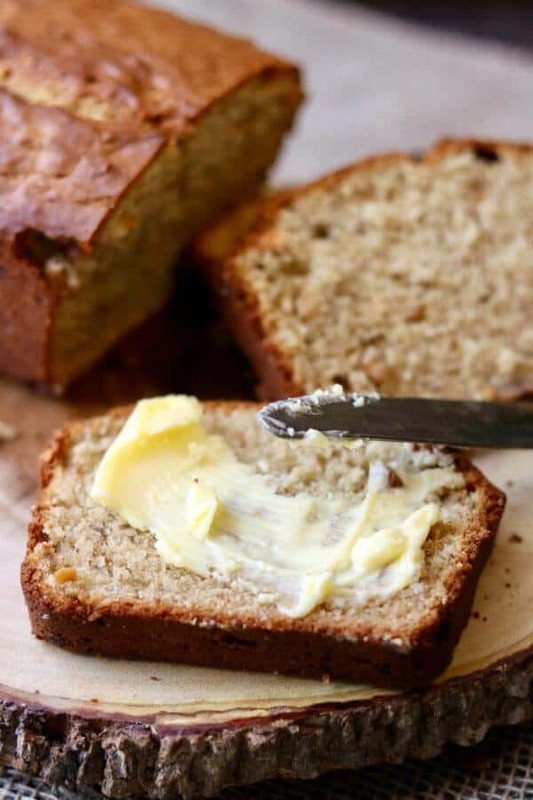 You can take it out, slice it, and put it back in the loaf pan to store. I love that! 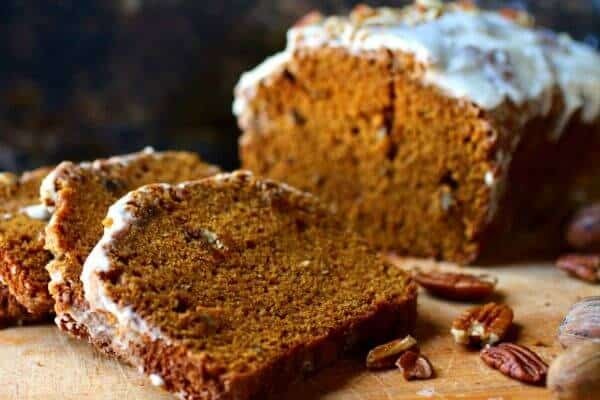 This vintage recipe is one of the best memories of my childhood. Ripe bananas and crunchy peanut butter come together in a perfect sweet, salty bite. Grease a 8.3 x 4.6 - inch loaf pan. Cream the butter and peanut butter. Add sugar gradually and continue to cream until light and fluffy. Add the eggs and vanilla - beat well. Mix the dry ingredients and add to the creamed mixture alternately with the banana. Mix well by hand to thoroughly blend the ingredients but do not beat. Bake for 1 hour at 350F or until bread tests done. A toothpick inserted in the center will come out clean. Let cool in pan for 5 minutes then remove from pan to cool completely. Freezes well for up to 3 months. I started reading your blog and when you commented about missing and calling them all of a sudden mu parents telephone number came to my thoughts and my parents have passed away at least five years but I use to call them everyday. Brought tears to my eyes. Thank you for sharing some of your past. I am a grandmother of several children so am older than yourself but have several of my mothers recipes.